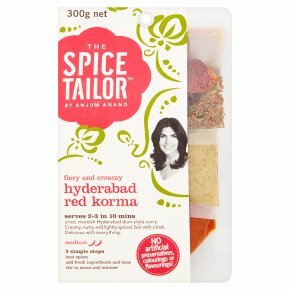 A spiced Indian curry sauce with yoghurt, nuts and spices in individual pouches. Chilli rating - medium - 2. Fiery and creamy. Serves 2-3 in 10 mins. No artificial preservatives, colourings or flavourings! Suitable for Vegetarians. A hot, moreish Hyderabad dum-style curry. Creamy, nutty and lightly spiced, but with a kick. Delicious with everything. The Spice Mix Dried curry leaves for aromatic warmth Whole red chilli for clean heat Black cumin seeds for a warming earthiness Cloves for pungent sweetness Green cardamom for freshness Sauce Facts Hyderabad is in the South of India in the region known as Andhra Pradesh. There are two different cuisines in this region, one which is based on typical Indian regional fare and also known as the spiciest food in India. The other face of this cuisine has been influenced by the Mughals who ruled Hyderabad for many generations. These Mughals came from Persia and Turkey and as such preferred their food creamy, yoghurty and mild in spice. These dishes exist today in tandem with spicier, more typical, Indian fare. This dish is where both cuisines come together. NOT SUITABLE FOR MICROWAVE USE.<br>DO NOT USE IF POUCH IS BLOATED OR LEAKING.